Manticore Search is a solution for building high-performance search applications. It is a fork of Sphinx search engine and, as it’s predecesor, it’s written in C++ and distributed under open source license GPL version 2.
hence the need for a dedicated full-text search engine, which can be fast but at the same time offer advanced features. In most cases, it is used to assist a traditional database by replacing the full-text search operations and in some cases it can help on non-full-text operations as well. A special utility is shipped along with the main component which can grab data from various sources (databases, XML or TSV/CSV pipelines) and build the indexes. 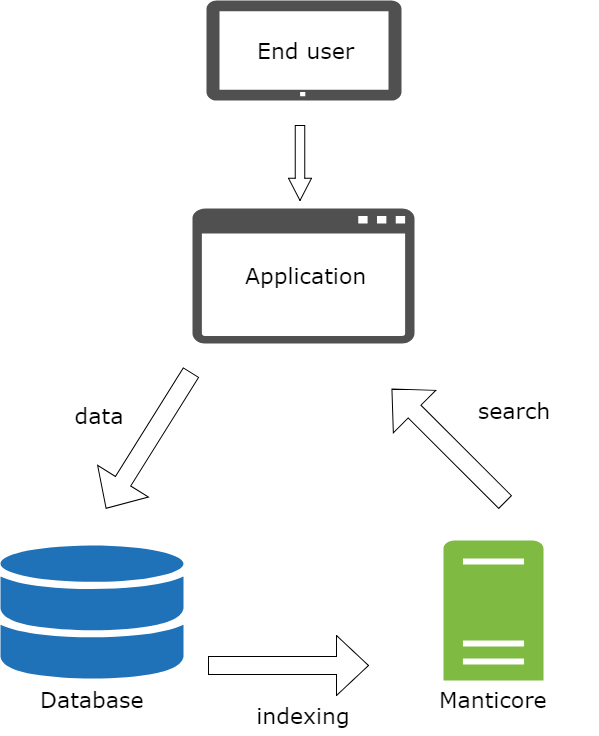 Manticore Search is similar in usage to a database: an application connects to it, performs queries, gets results, returns them to end user. Data can be also be fed into indexes like in a traditional database, in which case indexing is near real-time, without any dependency or connection to a specific database. Regardless of how data is indexed, there is no difference at searching. an own implementation of the MySQL network protocol, using a small SQL subset called SphinxQL. Any MySQL client/library can be used. Currently this is the recommended interface. In addition to regular text searching, Manticore can also perform inverse search (percolate queries), hit highlighting, word corrections, attribute faceting, geospatial searches. Manticore is designed to scale by supporting distributing a data collection across multiple servers and offer an internal load-balancer for High Availability.